Samsung Electronics’ first quarter earnings dropped 39 percent because of a big fall in revenue from its mobile business due to increased competition from Apple. The South Korean company reported Wednesday a net profit of $4.35 billion (4.63 trillion won) compared with $7 billion (7.49 trillion won) a year ago. The result was worse than the 30 percent decline the market expected, and Samsung’s own forecast for operating profit of $5.5 billion (5.9 trillion won). The company’s revenue slipped 12 percent year-on-year to $44 billion (47 trillion won). Samsung said its mobile division generated 2.74 trillion won in quarterly profit compared with 6.43 trillion won a year earlier. However, bigger overall sales could be connected to a loss in the high-end market to Apple. Consumers flocked to Apple’s new iPhones with bigger screens that were introduced in September. Earlier this week Apple released quarterly earnings that turned out to be its second-largest ever. The company reported $58 billion in revenue and $13.6 billion in net profit. The US tech giant sold 61 million iPhones in the first three months of the year while Samsung sold 83 million smartphones during the quarter, which is down 6 percent from a year earlier. 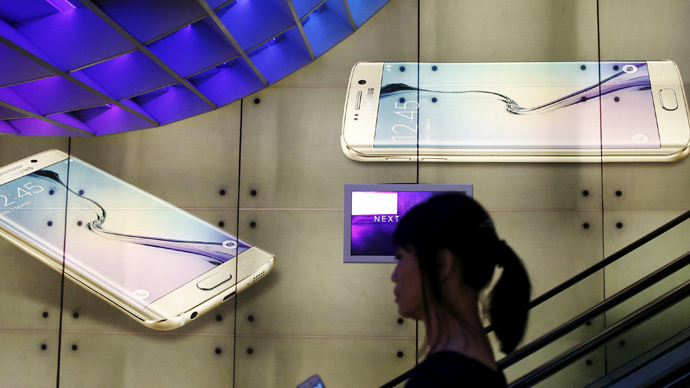 However, Samsung is optimistic predicting a recovery in the second-quarter. The company is counting on sales of its pair of new Galaxy phones - Galaxy S6 and Galaxy S6 Edge that went on sale in 20 countries on April 10. The South Korean company suggests that China and India will drive demand for its smartphones this year, despite the tough competition from makers like Xiaomi and Micromax in those markets. Samsung also sets its hopes on its semiconductor business which supplies chips and displays for makers of smartphones and televisions, including Apple. The components division began accounting for more than half of the company’s total operating profit from the third quarter of 2014, and contributed 57 percent of operating profits in the latest quarter.